Poconos Pocono NW Area resorts hotels motels lodging Pocono mountains Hotel motel resort hotel Pennsylvania pa.
Close to * Steamtown * Houdini Tour and Magic Show * Carriage Barn Antiques. Located off I-81. Check in time is 1500. Check out time is 1200. Close to * Steamtown * Houdini Tour and Magic Show * Carriage Barn Antiques. Located off I-81. Close to downtown Scranton. Located on Montage Mountain. Near Lackawauna Baseball Stadium and Montage Ski Resort. Minutes from downtown Scranton and Wilkes-Barre International Airport. 3 AAA Diamonds, Just outside of Scranton. Guide dogs only. Restaurant, Cocktail lounge, Laundry valet, Shoe shine, Complimentary parking, Fax, copying, PC/printer. Voice mail, Data ports on phone. Safe deposit box at front desk. Newspaper delivered Mon-Fri. complimentary in room coffee. Iron and Ironing board. Exercise room. Close to Houdini Museum Tour & Magic Show. Areas served are Moosic, Old Forge, Taylor, Dunmore, Pittson, Scranton Opened in 1996. There are 120 rooms on 3 floors. Check in time is 3pm. Check out time is 12noon. 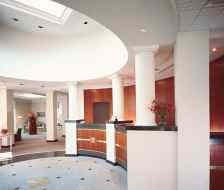 The hotel designed by business travelers, Courtyard surrounds you with all the conveniences that make business and pleasure travel easy. 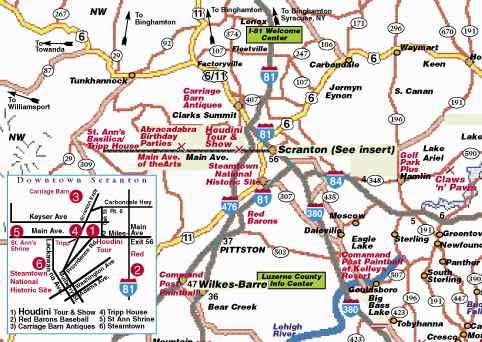 Di Y 66 Y N N N N N N N N Areas served are Clarks Summit, Scranton, Pennsylvania, United States Airports: Wilkes Barre / Scranton International Hotel Information 4 Sunbursts, AAA 2 Diamond hotel rating. There are 66 rooms on 4 floors. Check in time is 1:00 PM. Check out time is 11:00 AM. Hotel pricing classified low to mid-market range. Rates will continue to be lower than the full service properties in the area due to their meeting room space, indoor pools and restaurants on property or adjacent. 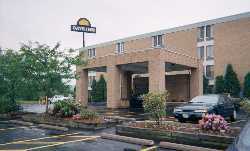 Areas served are Dunmore, Scranton, Wilkes BarrePennsylvania, United States Airports: Scranton Wilkes Barre International 3 Sunbursts hotel rating. There are 90 rooms on 4 floors. Time zone Eastern. Check in time is 2:00 PM. Check out time is 11:00 AM. of Scranton. Close to * Steamtown * Houdini Tour and Magic Show * Carriage Barn Antiques. .DUNMORE, PA I-81, Ex. 55 Sr 347 N. , .3 Mi. To Hotel On Left. Air Conditioning, Rm Cr - Faucet Lever Cr - Shower Massage Cr- Coffee Maker Cr-Door/faucet Lever Cr-Lg Button Remote Cr-Lg Lcd Alarm Cloc Cr-Lg Phone Dial Pad Cr-Light Bulbs, 100w Cr-Tub Grab Bar Fax Machine, Gst Use Handicap Rooms Ice Machine King Rooms Non-Smoking Rooms Parking, Bus Parking, Truck Parking,car, Outdoor Phone, Touch-Tone Tv, Cable/satellite At T Long Distance Coffee Pastry,free Fire Safety Act 1990 Pets Allowed Phone,local, Charge Wake-Up Service AAA 2 DIAMONDS hotel rating. Max 5 Persons In A Room.
. - SCRANTON, PA, US 18505 Close to * Steamtown * Houdini Tour and Magic Show * Carriage Barn Antiques. Montage ski area 2 miles. Steamtown 10 minutes. Houdini Museum Tour & Magic Show. Restaurants 5 minutes away. Restaurant and lounge on the property. Red Baron Baseball Stadium 2 miles. Marriott's economy hotel lodging chain features clean, convenient, quality accommodations and the peace of mind you get from Marriott consistency - all for a great value. The Fairfield Inn Scranton is located near The Houdini Museum Tour and Magic Show, Carriage Barn Antiques, and Steamtown National Historic Site, three miles from downtown Scranton. Areas served are Carbondale, Chinchilla, Clark Summit, Scranton, Wilkes-Barre. Opened in 1999. There are 81 rooms on 3 floors. Check in time is 2pm. Check out time is 12noon. Located off I-81. Check in time is 1500. Check out time is 1200. Di Y 139 Y In N N N Y Y Y Y Jacuzzi. 320 Franklin Ave. Franklin Ave. and Mulberry St.
- SCRANTON, PA, US 18503 * Wilkes-Barre Scranton Airport nearby Areas served are Scranton, Wilkes-Barre, Pittston, Dunmore, Clarks Summit, Hamlin, Pennsylvania Airports: Scranton International There are 98 rooms on 2 floors.Check in time is 2:00 PM. Check out time is 11:00 AM. Holiday Inn Express(See also Pittston. Golf ,ski Pkgs. Jacuzzi Rooms. General Description of Rooms - Whirlpool Suite King Whirlpool Suite with 1 King Bed 2 Person Whirlpool and Sitting Area - Presidential Suite with 1 King or 2 Double - Deluxe Room Bedding Varies - Standard Room Bedding Varies AAA four stars. Close to * Steamtown * Houdini Tour and Magic Show * Carriage Barn Antiques. Di Y 104 Y Out N N N Y Y hall? gym? Just outside of Scranton. Close to * Steamtown * Houdini Tour and Magic Show * Carriage Barn Antiques. Airports: Wilkes-Barre/Scranton International AAA Approved hotel rating. There are 108 rooms on 5 floors. Check in time is 1:00 PM. Check out time is 12:00 PM. Just outside of downtown Scranton. Areas served are Clarks Summit, Allentown, Scranton, Hazleton, Wilkes-Barre, Carbondale, Menhoopeny, Pennsylvania. Viewmont Drive - DICKSON CITY, PA, US 18519 Residence Inn by Marriott is designed to make you feel at home for a day, a week, a month or more. Their suites give you fifty percent more space than a traditional hotel room. 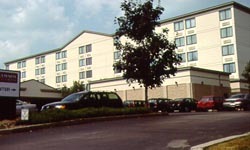 The Residence Inn Scranton is located ten miles north of downtown in the suburb of Dickson City and is just 1/2 mile from Viewmont Mall. 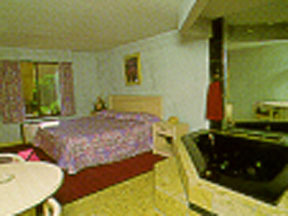 *** Studios are large open rooms with one king bed, full bath and furnished living area. One bedroom suites have a separate bedroom with one queen bed, full bath and furnished living room. Two bedroom suites have two separate bedrooms with one queen bed each, two full baths and furnished living room with sofa bed. 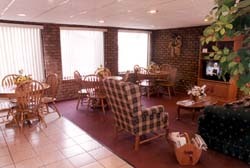 All accommodations have a fully equipped kitchen including coffee maker and full-size refrigerator with icemaker. A complimentary continental breakfast is offered daily in the Gatehouse featuring a variety of breads and pastries, cereals, fruits and juices, hot and cold beverages and local specials. Opened in 1999. There are 78 rooms on 3 floors. Check in time is 3pm. Check out time is 12noon. Shadowbrook is a year-round resort. Located in the peaceful endless mountains, Shadowbrook has served northeastern Pennsylvania and surrounding states for over 38 years. Featuring an 18-hole golf course, swimming pool, bowling lanes, miniature golf and much..much more. The wide range of activites at Shadowbrook is ideal for family getaways,company outings or family reunions. © 1993-2015 by MagicUSA.No part of any of this document may be reproduced in any form, without written permission. The graphics have been retouched, computer enhanced and resized by the authors.